I had returned to Red Rocks for the third time in less than a month, a pretty good indication that I was having great fun and had become somewhat obsessed with the area. Today's outing was supposed to be a climb of Ice Box Peak, a short mileage outing with some stiff class 4-5 scrambling according to Purcell's Rambles & Scrambles. That didn't go so well. Following that, I made two other excursions to tackle a small handful of towers and summits clustered in groups of three that I had run out of time for on previous visits. They helped make up for the early morning failure and I finished very satisfied with the day's outcome - Ice Box would simply require a little more homework before trying again the next day. I knew the Ice Box Canyon Trail to be a popular one so I got an early start, around 6:30a, to allow me to explore this canyon before it grew more crowded. The Ice Box TH is located just south of the Willow Springs Spur road along Scenic Drive. Mine was the first car to arrive and I wasted no time setting out. The trail leading to the canyon is well-maintained with some finely crafted step sections that must have taken many hours to construct, but also fairly short, stretching only about 2/3mi before it unceremoniously dumps one into the dry creekbed. Then begins the 1/2mi section of "trail" which follows upstream, a modest boulder scramble with some use trails making easier work of a few harder sections. A number of spur trails branch off, some reconnecting, others going off to rock climbing or bouldering destinations or as sometimes appears, simply into the weeds. Route-finding is not an issue, for the trail at least. Finding the exit point to start up to Ice Box Peak is another story. My guidebook led me to believe I would find the exit point "just before" a prominent fork near the end of the trail. I found this junction easily enough, the left fork leading to a cool amphitheater with no exit point that marks the end of the trail. Just before this I found a class 4-5 exit that seemed to fit the description, somewhat. I climbed about 50ft up to a ledge that led to a high point inside the amphitheater where someone had scrawled some graffiti with blue paint. Getting higher than this looked possible, but even harder than the spicy stuff I had already done. I'd found no ducks, but there were three coins on a small ledge just above the starting point that had given me some hope. I couldn't figure out how the 52 Peak Club managed to get all sorts of folks up to this peak unless there was another way up. If this was it, it was beyond my comfort zone and I decided to climb back down. Walking back down the creek, I explored other options as I noted them but found nothing I could make work and eventually gave up altogether. I would need to get more beta for this one. Having squandered two and half hours (ok, that's not really fair - any such wandering about on new territory is hardly "squandered"), I was itching to get back on track. These three closely-spaced towers are hardly prominent or even notable among about a dozen such towers and pinnacles that can be found on the East Face of Bridge Mtn, but they're all reachable via scrambling and have become trade routes in the peakbagging world. Though the approach and climbs are short even by Red Rock standards, they are all rated class 4-5, a challenge by most measures. Evas Tower appears on the 52PC list so I expected to find a well-ducked, trimmed, and appropriately fixed route heading up. Beer & Ice Peak, found above Evas, has a reputation for being one of the harder-to-reach summits in Red Rocks, so it would be a good test of my soloing route-finding and scrambling skills. Mikes Tower is just another bonus on the way to the other two. I moved the van to the small turnout on the left recommended by the guidebook about 1/3mi before the Pine Creek TH. I found another car here, sporting a 52PC sticker on the back window - seems I might not have the place to myself. I crossed the road and dropped to the wash on the other side, easily finding the beginning of the advertised use trail that would take me up the East Gully just north of the three summits. The directions in the guidebook are very good but unfortunately I didn't read them correctly. The proper route is to continue up the East Gully until reaching the obvious headwall, then follow a continuing line of ducks south up a steeper gully to the summits. Purcell calls this the North Gully. Instead, I turned south much too early, following a set of ducks to a similar notch well east of Mikes Tower and the others. It even featured a fixed line which I used to reach the notch itself. A tower in place of where I expected to find Evas Tower was exceedingly difficult, not a scrambling route at all. Hmmm. I consulted my GPSr at this point, showing quite clearly that I had taken a wrong turn. A duck on the south side of the notch gave me some hope that their might be another way to reach the three summits, but I gave up on this almost as soon as I considered it, finding the route brushy and difficult. Back down I went. It did not take long to correct my mistake, losing only about 20min all told. I followed into the correct chute on my second try and made my way up, aided by two fixed lines and plenty of ducks. None of the scrambling seemed particularly difficult, perhaps made easier by route improvements over the years. It was obvious where the route forked left to Mikes Tower and it was here I headed first, reaching the top by 11:10a. After several false starts, I'd finally reached a summit - yay! Evas Tower was now clearly discernable to the south, Beer & Ice behind me to the west somewhere. A register I found in the usual ammo box had eight pages dating to 2012. Most of the entries were from 52PC or HLV (Hiking Las Vegas), both Branch Whitney hiking clubs. It took less than 15min to get from Mikes to Evas Tower via more class 3 scrambling. The register's four pages dated back less than four months, easily the most popular peak of the three. From the summit I spied a pair of climbers atop Beer & Ice, now due west, most likely from the car I had parked next to. They had seen me too, apparently long before I had seen them, I was to find. I set off to pay them a visit before they left the higher summit. Though the guidebook offers what is probably a helpful description, I found that simply following ducks to work quite nicely. As I approached the summit block a pair of figures leaned over. The one with a mustache asked who I was. Recognizing him, I replied, "Is that Branch?" It was, but he still wondered who I was. I gave him another clue, "I met you 14yrs ago on during the Sierra Challenge." Still nothing, but when I gave him my name it came flooding back to him, "That was on Mt. Russell, right?" It was. Branch proceeded to offer me some pointers on how to get up the summit block while he and his companion were preparing to rappel off the top. I joined them at the top after the clock-wise move around the summit block to reach it from the south, after which we shook hands and he introduced me to Kathy. They'd been watching me for some time, it seems, and had noticed me go up what Branch called Chute #1, wondering about my intentions (Chute #3 was the correct one, called the North Gully by Purcell). It made more sense to them when I explained I had simply gotten lost. They offered to let me share their rope off the summit which I happily accepted. We took some photos of each other, I signed the register and then we rapped off, Branch first, then Kathy, myself last. Branch suggested we might descend to the southeast down a different route which I gather he hadn't previously done, but upon examining it thought otherwise as he thought the unknown rappels with three of us might be too time-consuming. Instead, we squeezed through a narrow crack (described by Purcell, but not used on the ascent) to get back to the route down Chute #3. The three of us then began descending the regular route in fairly quick fashion until we reached the first of the fixed lines. Branch and Kathy decided to rap down this while I downclimbed it as a hand line. At the bottom I shouted up that I was going to continue down to which they replied with goodbyes and parting comments. Branch gave more advice, of the motherly sort, describing various obstacles below and which way I should turn, etc. Having already come up this way earlier, I wasn't really listening, but I realized he just couldn't help it. He's spent so many years leading hiking groups that he can't but help feel responsible for everyone he climbs with. Knowing he meant well, I thanked him for the advice and headed down, the last I saw of them. The two were no slouches, to be sure, but I was kind of glad to be back on my own at my own pace. I still wanted to get to some other summits this afternoon and didn't want to lose more time than necessary. It was 1:40p by the time I returned to the TH, leaving me with plenty of time for another outing. These minor summits are located below Juniper Peak about a mile south of the other three. Tom Becht and I had made a feeble attempt to reach them from Juniper Peak a week earlier, but without success - cliffs block access between the two and we hadn't the resources or wherewithall to manage it. Coming back for a second try, it would be easier to use the standard routes from below. It took only a few minutes to move the van down the road to the Pine Creek TH, though by this time the lot was overflowing and I had to find a spot out on the main road. The trail was quite busy when I headed out at 1:50p, following it to the remains of the Wilson homestead overlooking Pine Creek. I turned south here to find my way across the creek and up the steep embankment on the other side, somehow missing the maintained trail (plenty of use trail though!). I found the main trail above and followed this a short distance until it leveled out. Here I spied ducks leading west up the East Face route to Magic Mountain. An easier class 2 route can be found further south, but the East Face gets four stars in the guidebook as opposed to the two stars for the East Gully. And it didn't disappoint. Generously ducked, the route wanders up to the base of the cliffs on the east side, then begins to pick its way up and left through them in splendid fashion. At one point it nearly joins the East Gully route before veering back to the right with more fine scrambling, some downclimbing, tunneling and other good fun that justifies the rating. Two fixed lines are found along the way - the first seemed quite helpful but the other wasn't really necessary (it protects an airy class 3 set of moves). It was 2:45p by the time I'd climbed the East Face to the crest, reaching a notch just north of the summit. I wasn't exactly sure how to get to the top at this point and spent some time looking around. I eventually settled on a very dicey class 4 slab on the west side that I came to find was NOT the usual route. Easier climbing above led to the summit register at the northern of two summit blocks. I didn't visit the south block which seemed to be of the same height, but was later told was the true summit block. Why the register on the northern block? Who knows. I signed the register and looked around for a more reasonable descent. I had left my rope and gear back in the van when I started out, so rappeling was not an option on this one. I found a fixed line coming up a steep crack on the east side - somehow I had walked right by it as I was finishing the East Face route earlier. I downclimbed this before following ducks back up and over the crest and around the west side of Magic Mtn. More wandering ensued before I found the key leading me south to the top of the East Gully route. From this notch I found my way around to the west side of Rose Tower and climbed that via class 3 slabs. 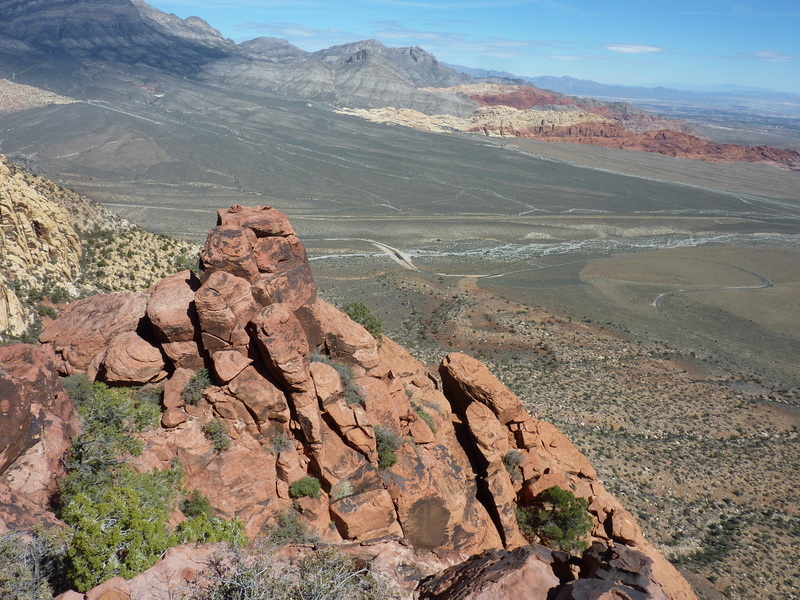 The two register books here were completely full - another quite popular Red Rock summit. I returned to the notch via the same route and then headed west to Ramp Peak. Also known as Crabby Appleton, Ramp Peak seems more appropriate as it has a 1/10mi-long ramp rising west to its highpoint. A fixed line is used to protect a sloping horizontal traverse around a large rock. Given that Ramp Peak is also a 52PC summit and sees a great many visitors, I can see the logic in having the rope even if it isn't all that necessary. From the summit I had a fine view of the cliffs to the south that had stopped Tom and I that previous trip. From below, the cliffs did not look so intimidating and I could see several possibilities to rappel down this side, to be left as a future endeavor. There is also a fine view of Bridge Vista and Bridge Point to the north across the deep gorge carved by Pine Creek. Higher than Magic Mtn and Rose Tower, Ramp Peak easily looks down on both of these to the east along with Red Rock Canyon and the Las Vegas Valley in the distance.